An expert in the technology sector, Atul Mathur has 20 years of experience in IT and consulting. He uses his expertise daily as Vice President of Technology at IMC. Technology as of late has not only shaped and molded the federal technology sector, it has also revolutionized it. Mathur has witnessed the changes the public and private sectors have had to make in order to keep up with these recent technological advances. We started our conversation with the executive by discussing big data’s impact on business. WashingtonExec: How would you define the term “big data” and how do you think it’s changing the business landscape? Atul Mathur: My definition of big data is any data set that fits into the four V’s – volume, variety, velocity and veracity of data. What is making all of this interesting is the unstructured data side of it where the data doesn’t fit nicely into rows and columns, which means that it is not structured; it is unstructured data. In that case you have to use natural language processing tools, or text analytics if you will, to make sense out of the data. Interestingly, IMC has worked in this space for several years especially on the health and life sciences side and we have built taxonomies and ontologies to store, manage, and discover scientific data. We have a lot of experience in this space. I think the education side of it is really important on how big data can be leveraged and data analytics can be used to make certain business decisions. WashingtonExec: Do you think unstructured data like social media trends should be monitored archived by the federal government? Atul Mathur: It’s an interesting question. For federal agencies, electronic records management is a presidential mandate. In 2010, President Obama came out with a mandate that all federal agencies will have electronic records management and move away from paper based records. Obviously, you wouldn’t want to store all social media content because then you will amass tons and tons of data which, unless you harness it, is pretty useless. Pharmaceutical companies, toy manufacturers, car manufacturers – they would want to archive unstructured data. What does the media think? What do people think? If there is a litigation situation, they would want to rediscover all of that content and pull it together to prove things one way or the other. For those types of industries, it definitely makes sense to archive social media data. Similarly in hospitality industries – hotels would like to know if their brand is trending up or down based on what people are saying about them. WashingtonExec: You spoke on a panel at an NVTC Business and Enterprise Architecture event earlier this year. How are you using business architecture to anticipate performance and investment impacts? 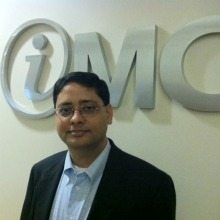 Atul Mathur: IMC works as a trusted advisor to several CIOs at a number of federal agencies and businesses and we have articulated our point of view in various aspects of business and enterprise architecture at NVTC and tech forums. Typically, people think of technology as soon as they hear the word architecture. But our belief is that business architecture is much more than the technology or IT side of things. We have helped several organizations in defining and leveraging business architecture to predict organizational performance and then to reap the benefits of the investment. As far as IMC’s market outlook is concerned – we are very positive and very upbeat about our market outlook and we have had several strategic wins in the first half of this year. We continue to do innovative stuff on our solutions. WashingtonExec: Do you think the government is behind the private sector in terms of big data technology advancement? Atul Mathur: Actually, I think that government has been on the leading edge when it comes to big data technology advancement. Some of the things that were done happened because of the way government was leveraging big data even before it was a buzz word. For example, the IRS mines vast amounts of data to detect potential fraud. As you can imagine they harness a lot of data, so from a volume and variety perspective you can think of structured data, unstructured data and multiple languages worldwide. They are collecting all of the data and making business sense out of, in their case, their business’ intelligence. They are harnessing intelligence out of structured data. That technology has been around for a while from a natural language perspective and to make sense out of unstructured data. Technology has now matured to a point where it is viable for that technology to be applied to commercial use cases. WashingtonExec: Do you believe in the mid-tier squeeze? What is the one aspect you would like to see improved regarding the federal government’s acquisition and procurement process? Atul Mathur: We do feel that mid-tier squeeze of being a mid-size company on federal contracts, either we are being pushed to partner with small companies or disadvantaged businesses, woman owned, Native American and what have you. On large contracts the government doesn’t see us as a large enough company to run those contracts, so we have to partner with larger organizations. From a contractual perspective and from an acquisitions perspective, I think the budget and acquisition policies of the government have lagged the technologies. For example, whatever the government plans today the acquisition happens based on that planning for the next three years. Technology completely changes in three years. So for example, we thought we had the best solution in cloud for government to manage content for a particular agency but the acquisition process did not allow for government to procure those services in the cloud. I think that the acquisition process needs to be re-thought and that’s when they will make it a level playing field. A lot of CIOs talk about it but I’m still looking to see a level playing field from a core technology and acquisition perspective. WashingtonExec: What is something that most people don’t know about you? Atul Mathur: A lot of people don’t know that I got a student pilot’s license several years ago. I plan to get back to my passion of flying again one day. WashingtonExec: What did you fly? Atul Mathur: At that time, I flew gliders but I’ve also done some flying on Cessna planes.